There are few things more frustrating than buffering when all you want to do is watch your favourite show on Netflix or scroll through Facebook. Here's how to solve it. There are few things more frustrating than buffering when all you want to do is watch your favourite show on Netflix or scroll through Facebook. Here’s how to solve it. WiFi can be exasperatingly slow at the best of times but there is something you can do about it! Providing that the issue isn’t your broadband package that is set up with an ISP like: BT, TALKTALK or PlusNet. We have another article on How To Test Your Broadband Speed. You’ll be able to see what the speed is and if that is your main issue or if it is another issue for example, the strength of your WiFi in your home. Your WiFi can be slow because of a few factors but they are mainly these 3 reasons; your incoming broadband speed from your ISP is slow, your WiFi is not properly boosted throughout your home or something is taking up all the bandwidth. ISP issues can be a troublesome issue as a lot of the time, your broadband is the best you can get otherwise your ISP would have already asked you to upgrade to a better service, but it is always good to contact them and ask if you can get faster speeds. WiFi not properly boosted throughout the home is also an issue which is very common, as standard hubs, you get with your broadband package, are not brilliant at providing a ‘whole home’ coverage of WiFi. Here is where WiFi extenders/boosters or access points are great, they will make the entire home accessible to WiFi. To increase your WiFi strength you’ll need to boost your signal in one way or another so that your devices are always in close proximity to your WiFi signal. Boosters come in different forms and offer different functions which suit different homes depending on overall size and density of the walls and objects which can block the signal. around the houseOnce the strength of the signal has been improved, you will be more likely to have a greater increase in the speed of your WiFi. The speed of your WiFi can never be improved past what your ISP is providing you with. For example, if you have BT Superfast Fibre broadband which gives you up 30Mb/s, you can never get more than that by adding boosters, but it does allow you to get that speed from more locations in your home. 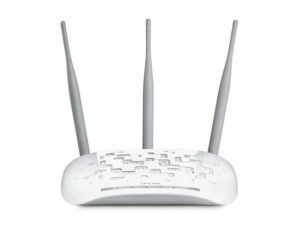 What’s a WiFi booster and where can I get them? A WiFi booster or extender is a device which takes your existing WiFi signal and then resends it out again from that point. The most common usage of a booster is in the Repeater function which identifies an existing WiFi Network like a BT Home Hub and then sends that out again to create a larger coverage area of WiFi without any need for cabling, as it is all done wirelessly. 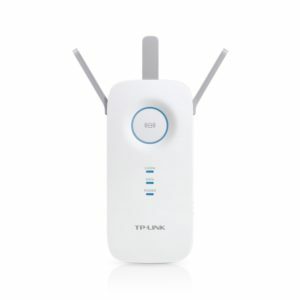 WiFi boosters or extenders are usually quite cheap and do a decent job at a low price point but typically the more you spend, the more complicated and better they get. However, for a home environment under £10080 will be more than sufficient, in fact some of the best home boosters are well under that price point. This Booster is nice and easy to setup and get your WiFi boosted throughout your home quickly. TP-Link products are great for home and small business usage and have the price point lower than other brands which produce similar quality. 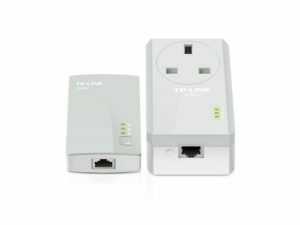 The WiFi booster plugs directly into a standard power socket and is therefore quite small. The AC1750 does however have 3 aerial prongs on the top of the device and therefore make it a bit less attractive than other models like the N300 but provides a better overall WiFi coverage. 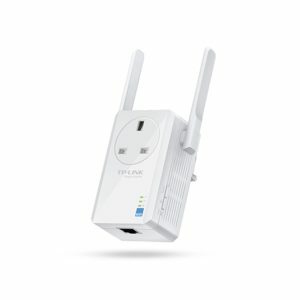 If you’re after an extremely affordable solution to get your WiFi boosted quickly but don’t want to pay a lot for it then this is the one for you. Below £15 at the time of this article, is very cheap but has its place and does it very well for its class. Also, it is one of the better looking WiFi extenders around as there are no external aerials or plug sockets. However, don’t expect it to boost your WiFi over large areas. It also doesn’t have a front plug capability, so you can’t plug in other household appliances for power like you can with the TL-WA860RE model. Not occupying a plug socket is one great advantage of this WiFi booster, as this device has a power socket on the front so that the socket that it is being plugged in to, can still be used to power other devices. It also distributes WiFi at a very reasonable range for the price point. But the socket adapter and external aerials do make it one of the more obtuse looking devices and isn’t as sleek as some other models especially the N300. What’s an access point and where can I get them? A device which provides a gateway or login point for network or internet access. These are typically used when there is a need to expand WiFi over large areas, which often requires multiple access points for WiFi, or across buildings.The main use of an access point over a repeater is because they offer a better coverage as they must be setup with a cable which links all access points together and not by WiFi, this means that there is no drop in signal quality like there is with a repeater because it is just copying and sending an already degraded signal. Access Points are usually found in business environments because their ease of control as they are all interconnected and can offer sophisticated user management. However, they also have their place in large homes or connecting buildings. Powerline adapters are great bits of kit that can get you out of trouble and work with most modern houses. They work by sending the signal through your electricity cables through your sockets and then is picked up by any receivers on the same fuse board. The limitation is that the signal sender must be on the same fuse board as the signal receiver, meaning that if you have a large or old home with multiple fuse boards, these are very unlikely to work as the sockets are not on the circuit as each other. 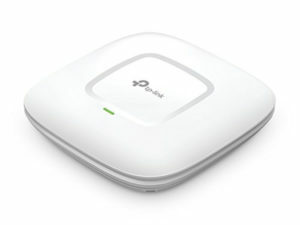 This access point is highly customisable and is our most popular device which we install as it is so versatile and offers great coverage, all at a very affordable investment. It’s great for when your home changes and you need different coverage, the device is so easily adapted, saving you cost from buying new devices. At this price point however, there is a limitation with the coverage it can offer. It also, isn’t the best looking or inconspicuous looking device which can affect the look of your table side. However, if you’re more focused on your WiFi strength and speed then it is easily looked past. This is a great WiFi access point as its coverage is very good and is better looking than other because it doesn’t have external antennas poking out. It is also, wall or ceiling mountable with a plate included to be secured to said wall or ceiling. Slightly more complicated to setup in comparison to the TL-WA901ND but does then allow for more options. 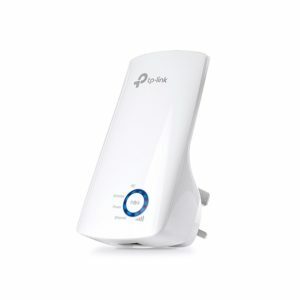 It can also be used in a series of access points to form a WiFi web of connectivity.. The device must have a dedicated cable running to it via a Power Over Ethernet (POE) adapter, which can get things slightly more difficult if you haven’t used POE before. It also does have a more complicated User Interface (UI) and setup process. I’m a bit confused, can you help? Yes! Help My Systems has years of experience with these networking setups, we can improve your WiFi greatly, with some minor adjustments. Give us a call or send us an email and we can get your WiFi sorted, permanently. Disclaimer The amazon links to the products are affiliate links, so when you use the links and purchase the product it helps us out at Help My Systems and enables us to keep creating free impartial content. All of the products shown are our recommendations because we have field tested them and are 100% happy to promote them.